So I've been running barefoot for about 9 months now and I'm starting to think that the BFR folks out there are a crazy lot of uninhibited, hedonistic nature lovers with a propensity for drinking. Just my kind of people! Well, this wild and wacky behavior has started something. But let me back up a bit. If you don't know about its inception let me tell you about Kate Kift's blog post. She recently (literally days ago) wrote about how she's noticing a new trend amongst the running crowd. A shift in perspective. The latest running accessory isn't our snazzy Garmin or cool Vibrams but the stupid grin on our faces. People are worrying less about their times and distances and are just having fun. Running is our passion. Passion isn't attached to numbers or distances. Its about the journey. We don't run a race and then throw in the towel because we ran a race. We keep running. Some of us don't even run races. We run for fun. Every now and then we might have a run that makes us giggle so hard we nearly pee our pants. Like the time we were warming down from a long run and my friend picked up her water bottle that she left in my grass and nearly ate a slug. Yeah. I'm laughing just thinking about that one. Or the time I almost lost my pants while running because my drawstring wasn't secured properly. Or laughing at my husband stepping on milkweed. I know. I know. I really shouldn't have laughed. But it was too damn funny!! The whole concept of running without pressure and with pure joy is so inspiring. (Apparently inspiring enough for Born to Run's Christopher McDougall himself to link to Kate's message on his blog ) And also inspiring enough for a small group of us to form the Run Smiley Collective where we can live in a fortress and keep chickens and bees and brew Run Smiley fire beer. Well, not really... but you can see how this whole "fun" thing explodes once you get rid of the seriousness. Actually, the Run Smiley Collective is a place where runners of all kinds (shod, unshod, drunk or sober) can read about and contribute their own stories of fun running adventures. We also have a secret handshake. Well its not really a handshake and its not really secret. If you have a blog post you want to contribute to the Run Smiley Collective just tag it with the "Run Smiley" or "Run :)" tags. You can also come join the collective over at Run Smiley and share your stories and pictures there. Everyone is welcome. Share the run love fiyah! This post is part of the Run:) collective. I am not running as much as I used to but when I do it is all about pleasure. And yes, I grin a lot. It is easy to spot pleasure-runners on the trail. Those the ones who grin back. You know I'm totally into this! As I said on Katie's post, barefoot running brings out the kid in me but also has made me mature and not worry so much about time and just enjoy the ride a little more. I love your artwork. I was hoping you would end up creating something and it's just perfect. I didn't read about it before, but my marathon embodied this perfectly. And it's the attitude that I loved reading about in Born to Run. Oh, plus I can't wait to tell my husband all the requirement for the Run Smiley Collective. HE was the one who got our chickens and bees are next but I'M the crazy barefoot one! I like it! HUGS Thanks Krista for all the post. I am blushing reading about it. Thank you for all your hard work; the logo is fantastic. It seems strange that only days after a random blog post, all of this has happened. I think it's fantastic how it's all grown. Almost like this was going to happen, but a random act in the universe just made it explode. 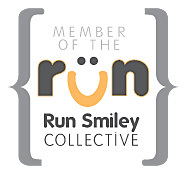 The Run Smiley collective is very embryonic, which is quite apt as it describes all of us that are taking part. Less than a week ago we were a random thought and now we have a blog, twitter account, facebook accounts, a whole host of contributors and friends. I don't know how long "The Run Smiley Collective" will go on for. I hope to see us blogging and tagging for a long time. Regardless, I think we have all had a great time setting this up. This is a group effort, we ARE a collective. I haven't seen so many excited people in a long time. It's inspiring. I LOVE, LOVE THIS!!! I lost my other blog..mamarunsbarefoot because I'm a dork! I'm so excited to join in this great group! You're awesome katie!! Love it! I predict the Run Smiley Collective will capture the hearts and minds of all runners, especially those who need a reminder of why we run - for the pure joy and freedom it provides. Glad to see you're down with the Run Smiley, Dave. Thanks for reading!